We have introduced the lovely story of Rainbow fish to our class as a means to communicate the importance of friendship, being kind and sharing with others. 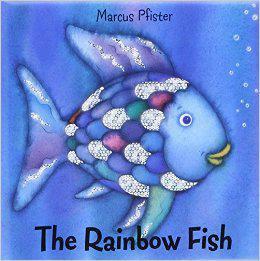 Over the two weeks the children have enjoyed acting out the story and telling Rainbow fish that he needed to share with the others. During our topic the children have been busy creating and have made a beautiful rainbow fish for the display outside our classroom. The children created the fish by hand printing and creating their own designs on foil fish shapes. We have had a range of different activities within our unit based on the story and the children have loved trying the new activities. The children are continuing to enjoy exploring our large garden. They have been busy using their problem solving skills to create dens. The children have then taken stories to read inside the den or have dressed up in their favourite super hero costumes and used the den as their base. Something else the children have enjoyed outside this week has been creating obstacle courses. The children worked together to create the course using a range of different equipment. If a child was struggling to get across the other children offered to help which was fantastic, well done!